A dilated examination of the retina is a necessary part of a visit to our practice. Examination of the retina (also called the fundus) is called fundoscopy. Your retina specialist can look at the retina using both high magnification with a hand held lens or contact lens to look at detail and then with a wide angle lens to look at large areas of the retina. Fundoscopy is the cornerstone of the retina evaluation. The vitreous humor comprises a large portion of the eyeball. It is a clear gel that occupies the space behind the lens and before the retina at the back of the eye. Because the eye must process visual data, this liquid must be clear enough that light can easily pass through. Most of this humor consists of water as well as a lower amount of collagen, salt and sugar. This humor is a stagnant substance that is not served by any blood vessels and is not actively regenerated or replenished. It is a contrast to the aqueous humor, which fills the anterior chamber in front of the lens. The vitreous often has debris in it which are perceived as floaters. 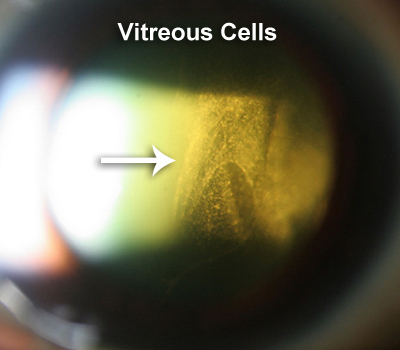 The vitreous is examined when the pupil is dilated for abnormalities, such as vitreous cells which can be red cells from blood, white cells from inflammation or pigment cells from retinal tears. 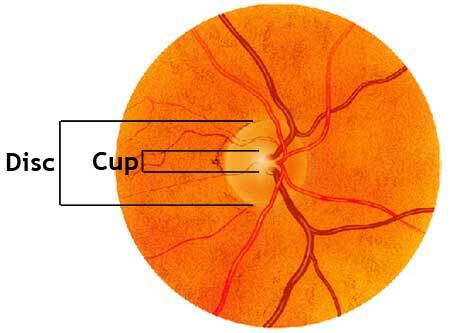 The examination of the optic nerve looks mostly at the cup, color and contour of the optic nerve. Abnormalities in any of these can signal significant eye disease. Slit-lamp measurements of the vertical and horizontal cup-to-disc ratios is determined. Asymmetry of 0.2 or more between the two optic nerves raises suspicion for possible glaucoma. The color of the disk is noted. Disk pallor is associated with glaucoma and with optic atrophy from other causes like ischemia and trauma. Focal notching, or thinning, of the neuroretinal rim may exist. This occurs particularly after resolution of splinter hemorrhages. The contour of the optic nerve is useful to note when looking for optic nerve swelling which can occur in cases of inflammation, ischemia, increased intracranial pressure and optic nerve drusen. The retina is a light-sensitive layer at the back of the eye that covers about 65 percent of its interior surface. Photosensitive cells called rods and cones in the retina convert incident light energy into signals that are carried to the brain by the optic nerve. In the middle of the retina is a small dimple called the fovea or fovea centralis. It is the center of the eye's sharpest vision and the location of most color perception. 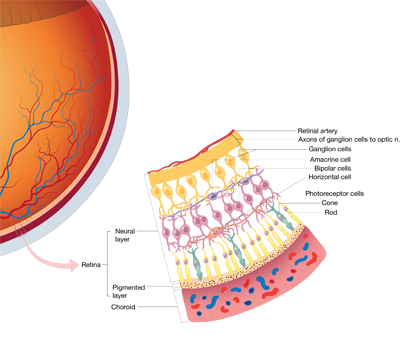 A thin layer (about 0.5 to 0.1mm thick) of light receptor cells is on the back surface of the retina. The focused beam of light is absorbed via electrochemical reaction called phototransduction. The human eye contains two kinds of photoreceptor cells: rods and cones. Roughly 120 million rods cover the peripheral retina and the macula and are responsible for night and for black and white vision. There are about 6-7 million cones that are concentrated in the center of the macula and are responsible for vision in normal lighting and for color vision. 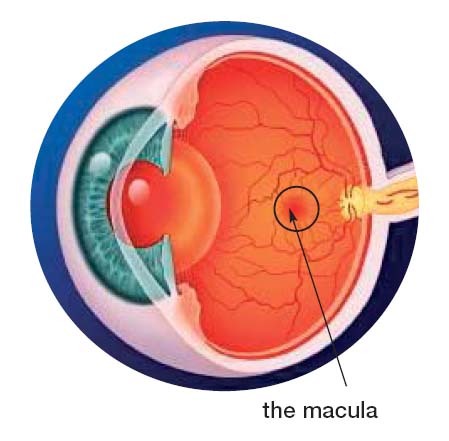 The macula is the center part of the retina. 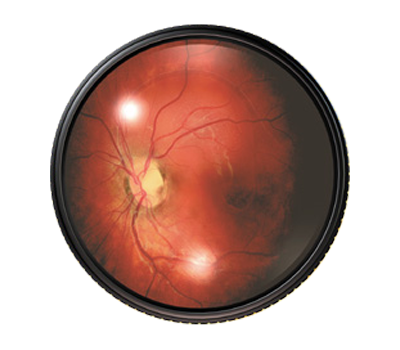 Most people who present with central vision loss from retinal disease have a problem in their macula. The eye has many more photoreceptors and other nerve cells in the center of the macula so that area has higher resolution vision than the rest of the retina. It is also designed with a curve to it that optically helps improve the resolution of the very center of the macula. The fovea is the center of the macula. When you look at a point or a letter on this page, you are using your fovea which is the center of the macula. When you look at the center of your computer screen, the whole screen is being perceived by your macula. What is the peripheral retina? The peripheral retina is the retina outside of the macula. 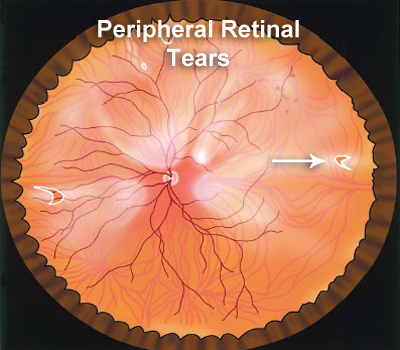 Problems that affect the peripheral retina are retinal tears and retinal detachments. Other problems that can occur in the peripheral retina include: choroidal nevus, hemorrhage, retinoschisis, retinal degeneration, retinal dystrophy, equatorial drusen, and choroidal tumors. A dilated examination is necessary to thoroughly evaluate the peripheral retina.